How time flies. This picture was taken …….. dang, I have forgotten when this was taken except that it was taken in Ipoh when I visited one of my Tai Chi teachers together with a friend and a student. This chap, DM, in the photo is an English chap who was living in Ipoh then. So when he mentioned that he was looking for a Tai Chi teacher I steered him to a teacher that I had previously learned from. DM and I had some good and fun times together. DM had a sarcastic dry wit and would call things as he saw it. I still remember that time we visited this Tai Chi master in Buona Vista. Unfortunately, after his marriage DM disappeared from Tai Chi circles. 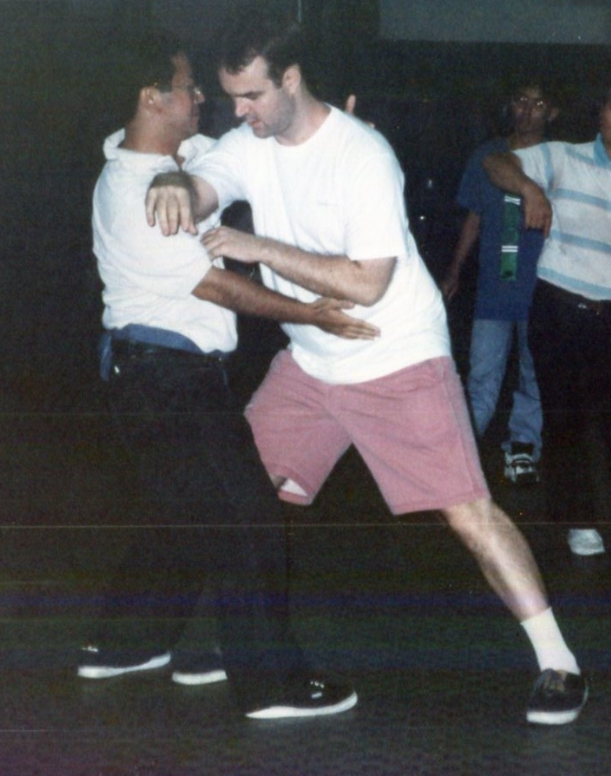 Friends such as DM contributed indirectly to the evolution of how I play push hands. At this period of time I was still using the Dong style method that I had learned. The Dong method had worked for me reasonably well until then though I could still not solve this killer move that my teacher had which I mentioned in this post here. In addition, I could not ignore the fact that if DM had been more skillful he would have made it more difficult for me to control him. Sometimes learning Tai Chi is not just about blindly learning and applying a method. I know that folks say if it ain’t broke don’t try to fix it. But from my work experience I also learned about not waiting for machines to break down before doing anything. If there is one important lesson to learn from the world of machine maintenance it is that a proactive approach to maintaining a machine is preferred to a predictive approach which in turn is better than a preventive approach. The preventive method is better than what is known as run-to-failure approach which is you wait until a machine breaks down before doing anything. Sometimes this approach actually makes financial sense depending on the context. Otherwise, run-to-failure can have costly and inconvenient implications. For example if you see a leaking pipe in your home would you wait until it bursts before taking action? So waiting for my push hands method to fail to work is not really a good idea. The better alternative is to push the limit myself and shore it up or bring in improvements before catastrophic failure, to borrow a term from engineering. One of the subjects that I had studied in university was Game Theory. Though I am not a mathematician I am fascinated by it and sought to apply it in push hands. For a long time I had no idea how to do so. But with more learning, time and experience I found a way to do so. This is why I call my push hands method Push Hands Game to recognize the role of Game Theory in it. Two men, Andy and Bob, were arrested after an armed robbery. The police had enough evidence to convict the two for the theft of the get-away car, but not enough to convict them for the actual armed robbery. However, if the police could get a confession from either of the two men they could conceivably convict them both for the armed robbery. If Andy confessed and Bob stayed silent, then Andy would go scot-free and Bob would be charged for the robbery and get 10 years in jail. Of course, this worked the other way around as well. If Bob confessed and Andy stayed silent, Andy would receive the 10 years. If Andy confessed and Bob confessed as well, then they would both receive 7 years in jail. If both Andy and Bob stayed silent, then they would both receive 2 years in prison for the get-away car robbery. The two prisoners are left to make their decision without any way to contact each other. The question is: what did each person choose? The study of Game Theory particularly Prisoner’s Dilemma ties in very well with the learning of push hands to enable my students to Master Tai Chi Today. Can you see the relevance? This entry was posted in General, Push-Hands and tagged singaporetaichi, taichi, taichichuan, taichisingapore, taiji, taijiquan, yang style by Mushin. Bookmark the permalink.